Tuesday at the AGU Fall Meeting was certainly a busy one for me (but then again, AGU never has a slow day!). I started the morning by presenting my poster in the session Undergraduate Research in Earth Science Classes: Engaging Students in the First Two Years. My poster was titled Student Contributions to Citizen Science Programs As a Foundation for Independent and Classroom-Based Undergraduate Research in the Earth Sciences and is pretty self-explanatory. You can see a PDF of my poster in Penn State’s digital repository ScholarSphere. I spoke with several people about coordinating citizen science projects with students and what some of our early data show. The most rewarding conversation I had was with two high school teachers from Maine that came by to learn about our Picture Post project, as they will be beginning their own Picture Post monitoring and data analyses with their own students in the near future. Standing in one spot from 8AM to 12:30PM is a little rough on the feet and the voice, but being able to share my work with other faculty, graduate students, and teachers makes the exhaustion level well worth it. I also was co-chairing another poster session at the same time on Audio for Earth and Space Science Education and Outreach. Talk about multi-tasking! Below is a photo slide show with some images of the poster hall – but note that I could not capture the over 3,000 posters presented each day at the conference in one photo! And that only brought me to lunchtime! 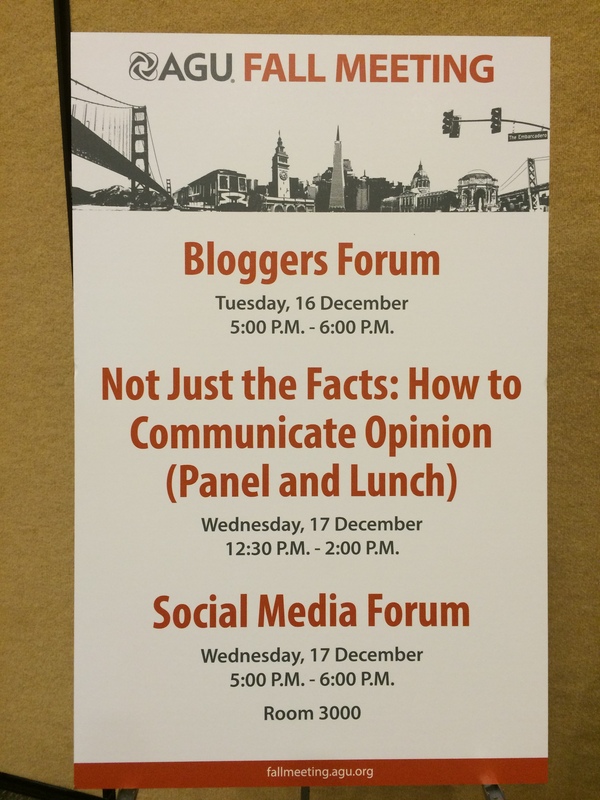 During the lunch hour, AGU has keynote speakers that are real innovators and inspirational. Today’s Presidential Forum had two speakers, Robin Chase, founder and former CEO of ZipCar, and Wendy Schmidt, President of The Schmidt Family Foundation. These speakers shared with the audience some outside-the-box thinking for how scientists can make a difference. Robin’s take-home message was that you can’t solve an exponential problem with a linear solution, which is why we need to leverage excess capacity, network diverse peers, and create a platform for participation. Wendy focused on science in a time of transition and why we need to care, especially challenging today’s scientists to communicate with visuals and networking tools. Both speakers took questions from the audience, and when asked, “how do we [scientists] better tell our story?”, Robin responded that we live in an age of sound bytes, and that “you guys need to speak up.” OK, message received! Robin also has a book coming out called Peers Inc., which looks like it will have additional tips and strategies for making a world of co-creators instead of consumers. I then spent some time going through the Exhibit Hall with Kimmie Bowen (current PSU Brandywine student here with me) and Abbey Dufoe (former PSU Brandywine student, now graduate student at Univ. Montana). Over 158 vendors were in the conference Exhibit Hall promoting their scientific equipment to books to educational materials. Some exhibitors you would be familiar with include Google, NASA, National Geographic, and Geological Society of America (if you follow my blog, you know about this group!). But exhibitors also came from around the world, such as the Japan Geoscience Union, Korea Institute of Geoscience and Mineral Resources, The Geological Society of London, and The European Space Agency. I was able to pick up some interesting handouts and resources that may serve as a foundation for future classroom exercises. I dashed through the rain between convention center buildings to head on over to the Bloggers Forum. I blog for AGU at the AGU Blogosphere as GeoEd Trek on geoscience education and educational technology, and I was honored to be asked to join their blogging panel. Over 50 people came to the session to hear a “recipe for a good blog,” tips on how to balance blogging and personal/professional responsibilities, how to choose topics, how to measure success, and how to get the word out. The most rewarding part for me was answering a question from an undergraduate student and speaking with her immediately after the panel about her strong interest in blogging and how to expand upon the blogging she already does. 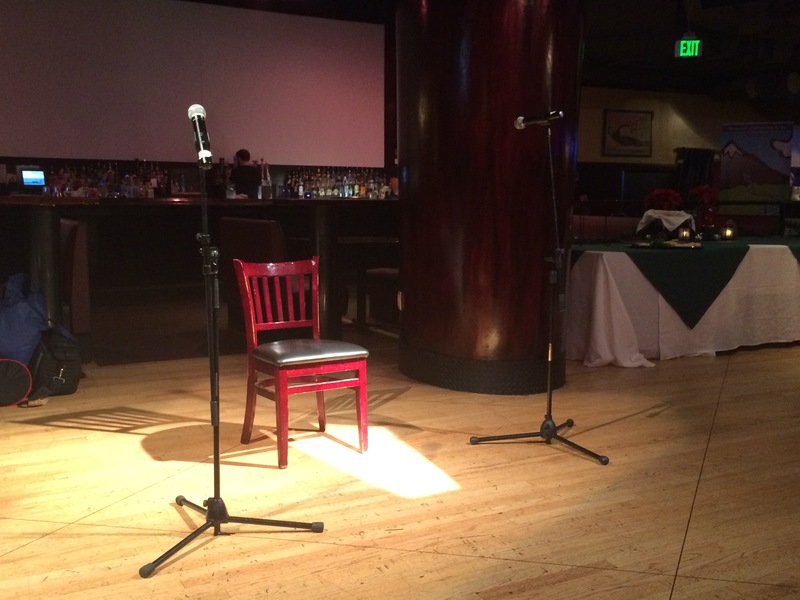 An open mic… ready for Open Mic Night! Then (finally!) the evening ended with a social event. We headed over to Open Mic Night, where scientists shared their non-scientific accomplishments, ranging from original poetry to songs to demonstrating mantle convection through juggling. This annual event has Dr. Richard Alley (Penn State University) serve as the MC. We thought the night would end with some bad science jokes, but Dr. Alley picked up a guitar and sang for us the plate tectonics version of Johnny Cash’s Ring of Fire. I was too exhausted to blog about my day when I finally got back to the hotel, so I apologize this post is one day late. I have another late evening activity today, along with another full day of the conference – time to get going!